These are exciting times. New transmedia projects are cropping up left and right and the debate over ”what the definition of transmedia is?” seems to have taken a bit of a step back. All in all it feels like we’re slowly – or perhaps rapidly; these are things that can better be assessed in hindsight – moving towards a media and content world where there is no need to talk about transmedia, as every project is as transmedia as it needs to be to fulfil any potential that project might have. I believe we’ve all heard of this one. A production by Universal Cable Productions where a TV series on Syfy is directly connected to the Defiance MMO game produced by Trion Worlds. You can read articles about Defiance here, here and here, and here is the Wikipedia article. It all looks promising, and they sure know how to get attention… but at the same time, I can see SO many pitfalls along the way to successful execution and long-term distribution. Still, I definitely want to believe, so I’ll be keeping my fingers crossed on the 15th of April, for a very successful launch of Defiance. Christy Dena is one of the smartest persons in the field of transmedia, so if she says this project will be a good one, I’m inclined to believe her. Right now there are some few precious hours left of the crowdfunding campaign, but which way that ever goes I’m quite confident this will see the day of light one way or another. A web audio adventure – or as the post on Reddit suggests, ”think if Bastion’s Rucks and Portal’s Wheatley guided you across the Net!” – with some appealing aspects; I really hope to see (or hear!) it soon! For an interview with Christy, have a look at a post I wrote a little while ago here. Every once in a while – and more and more often as of late – neat new ways of telling stories crop up. ”Murder in Passing” is the story of a murdered bike courier. At the same time it’s ”a Whodunit for commuters, with new episodes appearing daily on Toronto’s subway platform screens and online”. Commuters are invited to solve the riddle of the murderer and win prizes, with the final episode airing on the 1st of March. Personally I just really like the idea – it’s like elevators, where the best spot to place an ad would probably be in the upper corners of the elevator since everyone is looking there to avoid eye contact. The same here – everyone is at least glancing at the screens, and chances are the same people are in the same place at the same time at least five times a week. Great experiment if nothing else, and I’m eagerly awaiting a case study afterwards! beActive Media turned ten years earlier this year, and they’re as effective and as productive as ever. I feel Beat Girl deserves a mention here, even though the Pinterest-driven drama premiered last year already. It’s now that we can see just how the strategy works out for Beat Girl and how something that started as a way of using super-popular Pinterest in a storytelling setting is turning into a feature movie, gold records and a great project. The latest news – of US company Electus optioning hte US rights to the format – are just the icing on the cake. This case study – with all facts and figures pretty please! – is also one I’d like to take a closer look at. Well, it might be debateable whether this solve-your-own-adventure / puzzle book is truly transmedia or not, but I’ll happily give it the benefit of the doubt. It looks like great fun, with one of the best run Kickstarter campaigns I’ve ever seen. 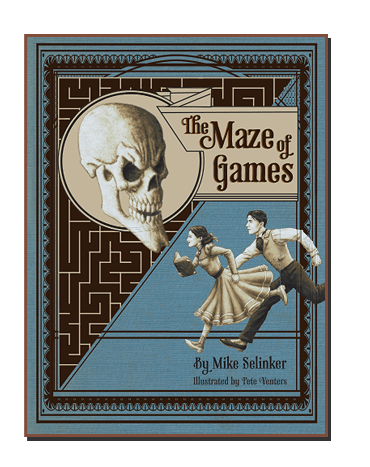 The stretch goals in and of themselves are magnificently thought out, not to talk about the puzzles hidden in the Kickstarter page itself and elsewhere. The review over at ARGNet, by Michael Andersen, should do the trick of convincing anyone still hesitating. It will be funded on the 14th of March, with delivery in November – apparently, Christmas might come early this year! Honorable mention also to just-launched and beautifully named “The Daring Adventures of Captain Lucy Smokeheart” by Andrea Phillips. If it looks interesting and it smells interesting and it walks interestingly, my bet is that it is interesting. This is so awesome! Seeing these ideas of transmedia projects has totally blown my mediocre ones out of the water. I’m really looking forwards to this semester.